The weekend after Portugal I headed down to Dresden for our school's annual volleyball tournament. Yes, I coach our girls volleyball team. Let me make one thing clear.........it is nothing like the States, but the girls are great to work with. 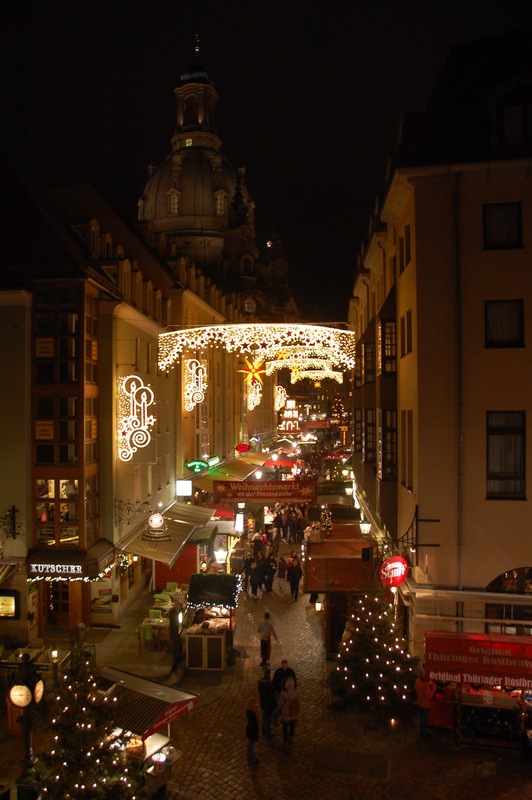 Besides the volleyball, the highlight of the weekend was the opening of the Dresden Christmas Market(s). 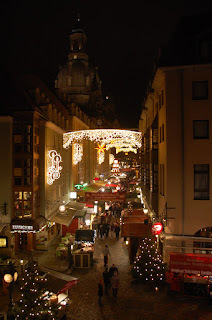 Not only did their main Christmas market rock but they had about 3 or 4 all over the main part of the city. Sipping on some gluhwein with the my assistent, Katie, boy's coach, Laura (taking the picture), male chaperone, Scott, and our athletic director, Ulli. 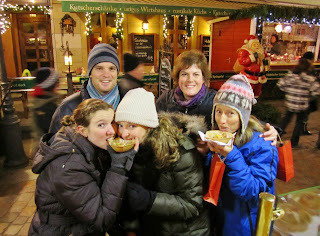 This was Scott's first Christmas market ever and I know the ladies and I showed him a good time! 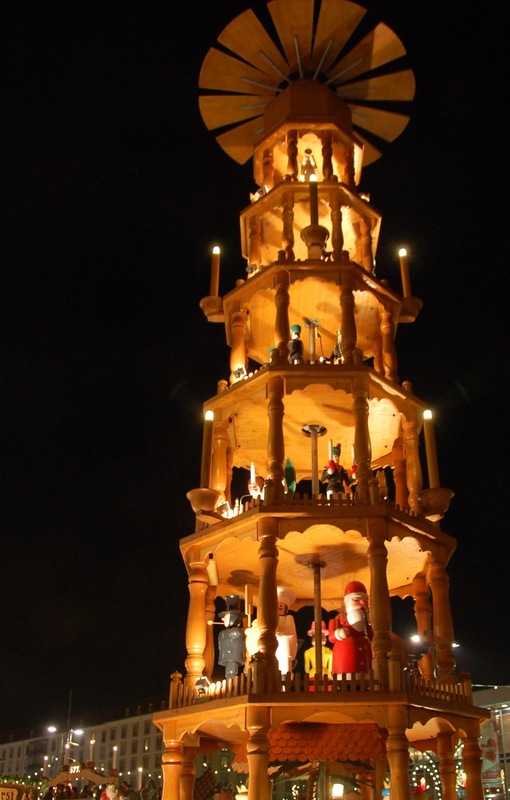 These bad boys are famous all around German and come in all different sizes. 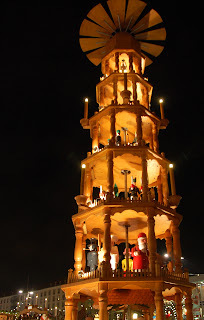 They are called Weihnachtspyramide and every house should have one. The beautiful Frauenkirche. I love the story of this church. 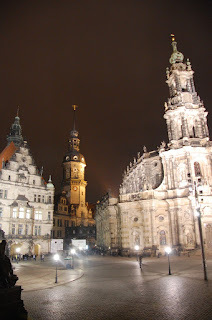 Read about it in our summer post about Dresden. Ulli introduced us to the most amazing dessert I have ever had. It might sound simple but it was incredible, a baked apple. Add some vanilla sauce, cinnamon and sugar and you have heaven and it even includes an edible bowl. One of the most interesting markets was the medieval market in the castle courtyard. Having been to many Christmas markets at this point in Germany, I will say that Dresden might be up there as one of my favorites. It was spread out which made it less crowded and I love how all the different areas offered different things. I hate when the different areas just sell the same stuff. 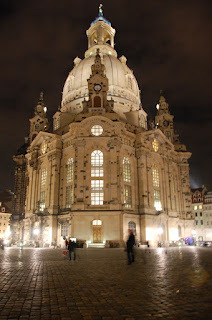 Dresden is a great city and definitely one you should put on the list any time of year but especially in December.